I found this blog very informative to see the disruption taking place in the automotive industry. I copied it from the site Capital Market Laboraties. A lot of the information we are about to cover could feel like a surprise, and in many ways it is. Tesla’s market size is more than three times as large as previously forecasted. All of these vehicles start around the same $70,000 as the Model S.
Just so we’re perfectly clear on this data: Every other luxury sedan saw falling sales while Tesla saw a 51% increase. Tesla’s Model S is now the single best selling large luxury vehicle and now owns more than 25% of the market. (Source: electrek). Tesla has already displaced the hallowed Mercedes brand. Those numbers presented above are basically a mathematical impossibility if not for one stunning secret: Not everyone buying the Model S was an owner of a $70,000 car before. In 2015, Jefferies conducted a survey of Model S owners and discovered that nearly 40% had previously owned a car that cost less than $40,000(Business Insider). That’s borderline ludicrous. Tesla is not only moving people up – it’s moving people up by staggering amounts. Here’s why that reality changes everything. Both the Model S and Model X have selling prices in the $70,000 – $140,000 range. Tesla aims to reach its 500,000 unit sale through a mass market vehicle – aptly named the Model 3. It will have an initial sales price of $35,000 (CNN Money). It’s this vehicle that will make or break the Tesla dream of a 1,000% unit sales increase in five years. Skeptics vigorously point out that even if Tesla is able to create a car with a $35,000 base price, the average actual cost, after options are added, will be above $40,000 and that is not a mass market vehicle. Here’s where that data on the Model S breaks eveything. We actually now know that the $70,000+ Model S is already poaching from non-luxury brands like Toyota even though the prices are wildly different. Keep in mind that Prius sales were down 11% last year and we have data from vehicle registartions that point to Tesla’s $70,000+ vehicles as a main culprit. All of a sudden, we’re now talking about Model 3 potentially competing with the Camry and Honda Accord and other non-luxury sedans. Camry and Accord alone sold a combined 784,742 vehicles in the U.S. in 2015. So, Tesla’s Model 3 will be going after two markets. First, the agreed upon “Midsize Luxury Vehicle” segment with its 508,000 unit sales in 2015. These are cars like The Audi A4, BMW 3-series, Mercedes C-Class, Acura TLX, Infiniti Q50, etc. The MSRP for the Honda Accord is listed in the range of $22,205 – $34,680 by KBB.com. The Toyota Camry’s MSRP comes in at $23,070 – $31,370. The Hundai Sonata is $21,750 – $34,075. Just those three vehicles alone totaled nearly one million vehicles. A car manufacturer can either be economy or luxury. It’s nearly impossible for a brand to transition to being a luxury item after targeting itself for the mainstream consumer. You see, each of those manufacturers came onto the scene as economy cars, so entirely new brands had to be created to sell luxury items. Tesla’s Model S is a race car cloaked as an electric vehicle that comes with options like ‘insane mode.’ Overall it performed so well that Consumer Reports literally had to recreate its rating system. The all-wheel-drive Tesla Model S P85D sedan performed better in our tests than any other car ever has, breaking the Consumer Reports Ratings system. By virtue of this hundred thousand dollar Model S ‘scale breaking race car’ and the Model X crossover, Tesla has established itself as a luxury automobile with one of the most valuable brand names in the segment. 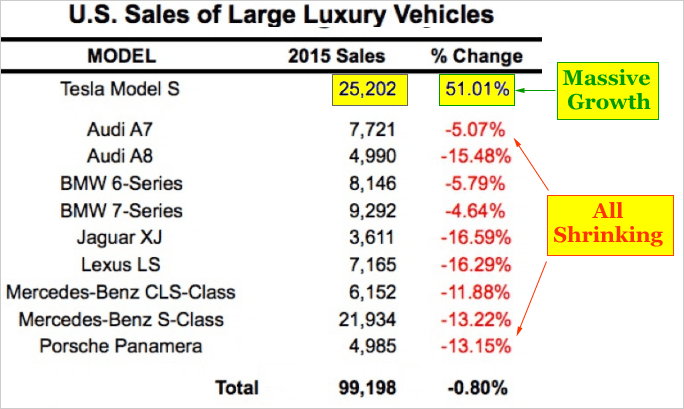 As we stated, Model S simply sold more units than every luxury sedan in the world in 2015. Now, when consumers have a choice between a Nissan Leaf, a Chevy Bolt, a Honda Accord, a Toyota Camry and a Tesla Model 3 all for the same price, you tell me: which car wins the market share? Tesla will start taking pre-orders on March 31st for its Model 3. A $1,000 down payment will be required. Soon after that, Tesla will tell the world how many pre-orders it received. This will be one of “the moments” for Tesla as an enterprise. The risk for Tesla is not any of the existing vehicles. We can see quite clearly that it is a total and utter disruptor, destroying demand for even the hallowed Mercedes Brand. Google’s plans are a bit less disruptive, but equally dangerous. If we’re looking for the possible derailment of Tesla – we can stop looking at existing automanufactures and start looking at the best technology companies in the world. We actually have three entire research dossiers dedicated to Tesla because there is so much going on. Our research sits side-by-side with Goldman Sachs, Morgan Stanley and the rest on professional terminals, but we are the anti-institution and break the information advantage the top 1% have. These are just two of the themes we have idenitfied and this is just one of the fantastic reports CML Pro members get along with all the visual tools, the precious few thematic top picks for 2016, research dossiers and alerts. For a limited time we are offering CML Pro at a 90% discount for $10/mo. with a lifetime guaranteed rate. Join Us: Get the most advanced premium research delivered to your inbox along with access to visual tools and data that until now has only been made available to the top 1%. Hoi Maarten, ongelooflijk dat Tesla Mercedes nu al van de troon heeft gestoten in de VS. Dit had m.i. niemand voorzien. Als de 3. het gaat doen zoals verwacht wordt dit wellicht de grootste shake up in de automotive industrie ooit.